Very few people have good posture. We sit in front of our screens worming around for hours on end, but hardly ever sit how we’re “supposed to”. We’ve all seen the pictures of how you’re supposed to sit, with your body at the optimal height so your wrists hit the keyboard at just the right angle and your feet perfectly meet the floor. In real life, that hardly happens, and very few of us have the money to sink into chairs and desks that can accommodate us perfectly. This all normally leads to muscle tension, very specifically in your neck and shoulders. While you can pay big money to see a massage therapist on the regular, it might be better to find a gizmo that can do the job for you. Of course, finding the one that will work right for you is the hardest part, as the type of massage varies a bit. 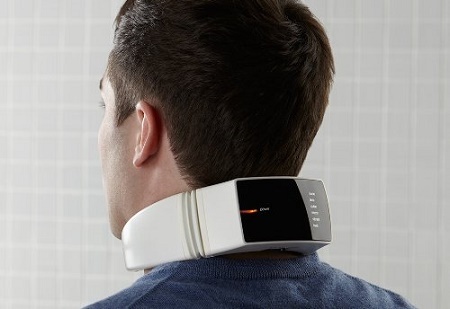 The Neck Massager with Wireless Remote Control uses vibration, Infrared Ray heat, and low-frequency electrical impulses to relax your tired muscles. You can choose to use all of these in various combinations or separately through the remote control, meaning you won’t have to take it off every time you want to change the settings. This will cost you $159.99, and fits neck sizes 9.6-23.8”. You’ll need to charge it for 6 hours before the first use, but will only need 2-3 hours after that to get to full power when drained. It can run for a total of 2 hours, and comes with six built-in therapy modes.